• Spring 2011 Planetary Seminars. HIGP Associate Researcher Milton Garcés, director of the Infrasound Laboratory and a 2011 PopTech Science and Public Leadership Fellow, gave a short, non-technical “pop talk” at the American Geophysical Union (AGU) 2011 fall meeting about infrasound: Sound generated by many natural phenomena like earthquakes, but are too low to be heard by humans. HIGP welcomes new SOEST Young Investigator, Assistant Researcher Peter Isaacson. With a research focus on infrared analysis of planetary surfaces and materials, Dr. Isaacson has extensive experience integrating remote sensing of the Moon with laboratory spectroscopic studies of lunar samples and analogues. He received his Ph.D. from Brown University in 2010 and completed a post-doctoral position there before joining SOEST/HIGP. A video, "From Deep Space to Deep Sea," highlighting U.H. research initiatives is featured on the U.H. News website and will play in the APEC host hotels this week. The video, about Earth, ocean, and space sciences in Hawaii, shows work at the Institute for Astronomy, HIGP, and SOEST, and includes a nice segment on the HIGP cosmochemistry program and W. M. Keck Cosmochemistry Laboratory. View the video at U.H. News. Video credit: 1013 Integrated. The Workshop on Formation of the First Solids in the Solar System was held November 7—9, 2011 at the Sheraton Kauai Resort at Poipu Beach, Koloa. This workshop was dedicated to HIGP Researcher Klaus Keil to honor his distinguished career in meteoritics and cosmochemistry, and was hosted by HIGP, SOEST, NASA Astrobiology Institute, and the U.H. Institute for Astronomy. Dr. Keil pioneered the use of the electron microprobe to determine the chemical composition of minerals in meteorites. He is one of the co-inventors of the energy-dispersive x-ray spectrometer used on electron microprobes and microscopes to analyze small samples. His wide-ranging research has covered all types of meteorites and Apollo lunar samples. Conveners included HIGP Researchers Alexander Krot, Edward Scott, and Gary Huss. For more details, see the Workshop website and the U. H. Press Release. Photo credit: Bob Chinn, University Relations. The 6th Biennel Geochemical SIMS Workshop (BGSW6) was held November 2—4, 2011 at the Outrigger Reef Hotel in Waikiki, convened by HIGP Researcher Gary Huss. The workshop gathered specialists in Secondary Ion Mass-spectrometry from around the world and was supported by NSF, Cameca Instruments, and Australian Scientific Instruments. HIGP's W. M. Keck Cosmochemistry Lab was open for special tours for all attending the workshop. See the BGSW6 website for full program and list of attendees. Did you know we are exploring the deepest ocean trench, volcanoes and lava flows, the Moon, Mars, and beyond? Did you know we are building satellites and have our own mission operations center? The 5th floor of the POST building on the U.H. Manoa campus was filled with energized and excited visitors on Friday and Saturday, Oct. 21 & 22, during the 11th biennel SOEST Open House (event info. and maps). The event drew 6,600+ students, parents, educators, and community members who connected with our scientists and engineers doing hands-on activities and laboratory tours. Photo credit: Patrick Gasda, HIGP. Lava flows that solidified into rock on the Moon are enriched with titanium in concentrations far higher than typically found on Earth. Detailed maps from NASA's Lunar Reconnaissance Orbiter (LRO), show deposits as rich as about 18 percent, said HIGP Associate Researcher Jeffrey Gillis-Davis, a participating scientist on LRO. “Up to three percent is considered high on Earth,” he said. The element is mostly found in the mineral ilmenite, which also contains iron and oxygen. Read more about it in Discovery News. HIGP graduate student, Myriam Telus, has been awarded a NASA Earth and Space Science Fellowship. Myriam is pursuing a PhD in cosmochemistry, working on iron and nickel isotopes in chondrules from primitive meteorites to develop the 60Fe-60Ni short-lived chronometer for dating early Solar System processes with advisor, Gary Huss, in the UH W. M. Keck Cosmochemistry Laboratory. This competitively-selected fellowship carries up to three years of funding. Myriam received her B.S. degree in Geophysical Sciences from the University of Chicago. Congratulations! The work of HIGP planetary and remote sensing experts is highlighted in the University of Hawaii at Mānoa Media Resources article, Charting New Space Frontiers. The Hayabusa mission, developed and managed by the Japanese Aerospace Exploration Agency, in 2003 sent a spacecraft to a near-Earth asteroid called 25143 Itokawa, returning with samples in 2010. The mission demonstrates that "solar system samples returned for study in terrestrial laboratories are crucial in understanding the origin and evolution of the solar system," notes HIGP researcher Alexander "Sasha" Krot in an essay accompanying papers about the findings published in Science. HIGP Associate Researcher, Milton Garcés, Director of the UH Infrasound Laboratory has been named a 2011 PopTech Science and Public Leadership Fellow. He joins a class of 10 scientists chosen for their innovative work in areas of critical importance to the nation and the planet. This is a yearlong program. Garcés works with very low frequency atmospheric sound, or infrasound, which is generally produced by large things that blow up. 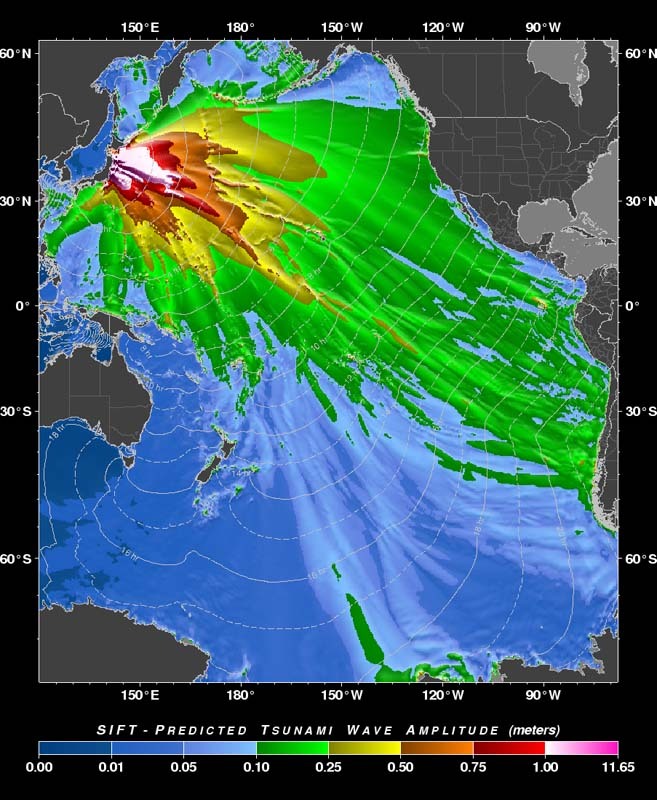 Infrasonic sources include volcanoes, meteors, tsunamis, high surf and severe weather – geophysical processes that may pose a threat to life and property. Garcés studies how the continuous streams of deep sound from stations distributed across the world can provide early warning of geophysical and geopolitical hazards. Read more in the UH Press Release. Congratulations! HIGP Planetary Scientist, G. Jeffrey Taylor, received the 2011 Shoemaker Distinguished Lunar Scientist Award, presented by the NASA Lunar Science Institute (NLSI) on July 19 at the Lunar Science Forum at NASA Ames Research Center. The Shoemaker Award, presented annually to a scientist who has contributed significantly to the field of lunar science throughout his or her career, is named after Eugene M. Shoemaker (1928-1997), considered a founder of the fields of lunar and planetary geology. Taylor's research focuses on the the origin, nature, and history of planetary bodies as revealed by the petrology and chemistry of lunar samples and meteorites. His work also emphasizes the use of extraterrestrial rock and soil samples as ground truth for remote sensing studies. In accepting the award, Taylor noted Gene Shoemaker would be delighted with the wealth of new data from the recent international lunar missions and especially with the exciting new research on water in and on the Moon. Jeff Taylor is the third recipient of the NLSI Shoemaker Award and the first from the University of Hawaii. Congratulations! Congratulations to HIGP and UH NASA Astrobiology Institute graduate student, Patrick Gasda, for being awarded the graduate student poster award at the Origins 2011 International Conference in Montpellier, France. This is an International Astrobiology Society and Bioastronomy joint conference with an interdisciplinary emphasis on the origin of life and its occurrence in the Universe. Patrick's winning poster in the Prebiotic Chemistry session is titled, "Raman Microscopy: A Technique for Monitoring Pre-Biotic Reactions on Mineral Surfaces." Félicitations! The UH Manoa Department of Geology and Geophysics has announced that HIGP graduate student, Myriam Telus, has been awarded this year's J. Watumull Merit Scholarship, supported by the Watumull Foundation. Myriam is a student of cosmochemistry working on iron and nickel isotopes in chondrules from primitive meteorites to develop the 60Fe-60Ni short-lived chronometer for dating early Solar System processes with advisor, Gary Huss, in the W. M. Keck Cosmochemistry Laboratory. Myriam received her B.S. degree in Geophysical Sciences from the University of Chicago. Congratulations! HIGP Alumna News: The American Geological Institute has announced that the 2011-2012 William L. Fisher Congressional Geoscience Fellowship has been awarded to HIGP alumna, Aisha Morris. Aisha received her B.S. degree in Geology from Duke University and M.S. in Marine Geology and Geophysics from the University of Hawaii. She received her Ph.D. (2008) in Planetary Geology also at UH Manoa under the tutelage of Peter Mouginis-Mark. The focus of Aisha's doctoral research was "Topographic and Geomorphologic Analyses of Volcanic and Impact-Related Landforms on Earth and Mars." Aisha is currently a post-doctoral fellow for the Alliance for Graduate Education and the Professoriate (AGEP) at Syracuse University. She serves as an instructor for undergraduate geology courses and for the Research Scholars High School STEP program. She also works with Girls Eyes Only (GEO), a science enrichment program and Girls Get It!, a science camp; both for middle school girls in the Syracuse area. Aisha's Congressional Fellowship in Washington D. C. will begin in September 2011. Congratulations! HIGP Associate Researcher, Benjamin Brooks, and an international team of colleagues report in the May 8 edition of Nature Geoscience that the region east of the central Andes Mountains has the potential for larger scale earthquakes than previously expected, based on new GPS data. Read more in the UH news release. The first natural occurrence of CaAl2O4 has been found in a meteorite and the discovery team has named the new mineral krotite, as reported in the May/June issue of American Mineralogist. Approved by the Commission on New Minerals, Nomenclature, and Classification of the International Mineralogical Association, the name honors Alexander N. Krot, HIGP Researcher, known for his achievements in meteoritics, especially for studies of the formation of calcium-aluminum-rich inclusions and chondrules in primitive meteorites. The discovery was led by Harold C. Connolly, Jr. of Kingsborough Community College of CUNY, the American Museum of Natural History in New York, and University of Arizona. For more information please read the PSRD CosmoSparks report " Discovery of New Mineral, Krotite, in a CAI". Read more at msnbc.com "4.5 Billion-Year-Old Meteorite Yields New Mineral", News@UH, and Honolulu Star Advertiser. We are delighted to say that Roy Wilkens has been awarded Emeritus Faculty status within HIGP by the UH Board of Regents. Roy has been an outstanding member of the HIGP faculty for more than 20 years, and he retired in December 2010. Roy has served on many research cruises, maintains a strong publication record, and has maintained an excellent funding record. Most recently, he has been instrumental in the development of the study of underwater munitions off the coast of Oahu, and served as the Director of the National Center for Island, Maritime, and Extreme Environment Security (CIMES), a Department of Homeland Security (DHS) Center of Excellence. Particularly impressive have been his efforts as CIMES Director; he has put UH on the DHS map and has facilitated many excellent new collaborations for UH investigators who now work with the Coast Guard on a variety of homeland security topics. We welcome Roy back to HIGP in his new position! Image courtesy of CIMES. During the tsunami that affected Hawai‘i the morning of Friday, 11 March 2011, Pacific Tsunami Warning Center (PTWC) geophysicist Gerard Fryer (HIGP affiliate faculty) kept local and national news up to date. Dan Walker, retired HIGP professor and tsunami adviser to the state Civil Defense agency, also commented on the event. Read more about it in the Honolulu Star-Bulletin. The Hawaii Beach Safety site provided updates through the night with state and national emergency links and notices. For links to information to help you prepare for tsunamis and other natural hazards, visit the Hawai‘i Ocean Observing System (HiOOS) Coastal Hazards page. Image courtesy of Nathan Becker, Pacific Tsunami Warning Center; click on it to see the full image. SOEST scientists are conducting a feasibility study to determine if vog forecasts for Hawaii are achievable and useful. Led by Meteorology professor, Steven Businger, the project includes HIGP assistant researcher Keith Horton as co-lead and HIGP associate researcher John Porter as collaborator. Vog is created when sulfur dioxide emitted by a volcano mixes with sunlight and dust in the air; it can pose environmental and health risks, particularly to people with respiratory illnesses. Go to the Vog Measurement and Prediction (VMAP) website. Read more about it in the UH News, KITV.com, and the Honolulu Star-Advertiser. Image courtesy of SOEST; click on it to go to the VMAP web site. The Hawaii Space Grant Consortium released its most recent newsletter. Nā Huakai translates to The Voyages and chronicles the latest educational and research achievements of UH students and mentors. Read it here. Copies are also available in the Space Grant offices in POST 501. Two articles in the January 2011 issue of Mālamalama, the magazine of the University of Hawaii, feature the high-technology work of HIGP scientists and engineers. The efforts of HIGP faculty Luke Flynn, Lloyd French, Paul Lucey, and Robert Wright and their colleagues and students are highlighted in "Sky Isn't the Limit for UH Spaceflight Lab" [pdf] [web]. This article chronicles the extraordinary plans and achievements of the Hawaii Space Flight Laboratory, the multidisciplinary research and education center established in 2007 within SOEST and the College of Engineering at U.H. Mānoa. The second article "Imaging Tool Could Boost National Security, Local Economy" [pdf] [web] features HIGP researcher, Paul Lucey, and the Honolulu start-up company now developing a hyperspectral sensor system with detection capabilities useful in commercial, research, military, and national security applications. Back-arc spreading centers found behind subduction zones are considered to be some of the most active plate tectonic boundaries on Earth. While current models show a gradational change in crustal composition as the plate travels away from the subduction zone, new research, reported in the prestigious journal Nature by G&G Associate Professor Robert Dunn and HIGP Researcher Fernando Martinez, shows that the changes in crustal properties are actually large and quite abrupt as the ridge moves away from the arc. Read more about it in Nature. Image courtesy of SOEST. We've assembled a list of HIGP authors and titles of abstracts submitted to the 42nd Lunar and Planetary Science Conference (LPSC March, 2011). See the list here (.pdf).